“I create my own script, which is why I am here for 20 years and the others have gone." HuffPost Canada is profiling each of the 2017 Conservative leadership candidates, leading up to the May decision. Deepak Obhrai is trying to make a point. Canada has changed. Young people and immigrants understand that, the Conservative candidate tells The Huffington Post Canada over lunch at the Fairmont Château Laurier hotel, a stone’s throw away from Parliament Hill. But the Tories’ base seems unable to accept it, he suggests. 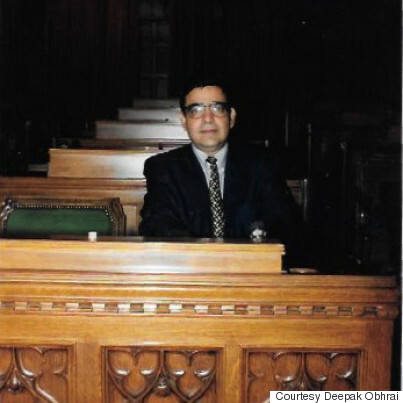 Deepak Obhrai is the longest serving Conservative MP in Parliament. The 2015 Conservative election campaign, with its “barbaric practices” tip line, pledge to deport dual citizens convicted of terrorism, and re-emphasis on banning niqabs during citizenship ceremonies, reversed many of the gains the Tories — primarily Obhrai and former cabinet minister Jason Kenney — spent years achieving within immigrant communities. On and off stage, Obhrai stresses that the Tories are in danger of further alienating a large segment of the population with antagonizing proposals, such as fellow contestant Kellie Leitch’s pledge to screen newcomers for Canadian values and require face-to-face interviews. “Why do you think I’m speaking?” the Calgary MP asks rhetorically. Obhrai orders a lobster Cobb salad and grabs a piece of bread. He heralds Canada’s successful integration model with new immigrants and suggests the base of his party doesn’t reflect or understand this experience. “When I go to EDAs [electoral district associations], all those white, old men sitting there who think Canada is still in the 1980s, 1970s, those are the ones giving [Leitch] money,” he says, munching on a piece of bread. Those are also the people writing to him every time he opens his mouth, he says. Most of the emails are anti-Muslim, many say he is out to lunch. Deepak Obhrai, centre, speaks at a Conservative leadership debate in December 2016, flanked by Chris Alexander, left, and Maxime Bernier. The two have known each other for years. Although Leitch’s party roots lie with the Ontario Progressive Conservatives and Obhrai’s are with the Reform party, he says he took her to many cultural events. Deepak Obhrai used a scooter while campaigning in the last federal election. Some people are very afraid of change, Obhrai says. They tell him Canada needs to remain “this type of culture” without sharia law and “all these things.” One woman who recently quit the board of his riding association told him Christians are under threat from Muslims and sharia law. At the same time though, Obhrai seems to relish responding to those who contact him. “It will never come,” he says. "I’ve been here for 20 years, for 40 years. I’ve gone through the whole experience of racism everywhere. Why do you think I’m running?" “I’ve been here for 20 years, for 40 years. I’ve gone through the whole experience of racism everywhere. Why do you think I’m running? … The others are not talking about it,” he says of his 13 competitors for the leadership. The lobster salad is delivered. Obhrai declines fresh ground pepper but accepts the offer of Tabasco sauce. “I’m Indian,” he says with a shrug and a smile. An undated photo of Deepak Obhrai in Africa. Obhrai was born on July 5, 1950, in Tanganyika (known as Tanzania since 1964) in a mountain town called Oldeani near the world-famous NGorongoro Crater. His father was a diabetic who died when Obhrai was six. His mother, armed with a bachelor’s degree, got a job at a bank. “If my mother hadn’t been educated, I might have been an under-the-tree mechanic,” he says, referring to informal shops that pop up in the countryside, literally under a tree. Obhrai went to primary school in Moshi, a town at the base of Mount Kilimanjaro. He attended high school in Arusha and was later sent to Indore, India, to study at the prestigious Daly College. At the time, Tanzania was a one-party socialist state, India a multiparty democracy. In 1972, Ugandan President Idi Amin ordered the expulsion of 80,000 people of Asian heritage. In the decade that followed, Tanzania nationalized banks and businesses, the vast majority of which were owned by Asians. Because they didn’t engage with the political system and “were not identified as locals, they had to leave,” Obhrai says. Deepak Obhrai worked as an air traffic controller. Obhrai moved to the Britain, where he studied to be an air traffic controller but realized he didn’t want to live there. “The British think we are ‘coolies,’” he says, referring to the term used in India for luggage boys. 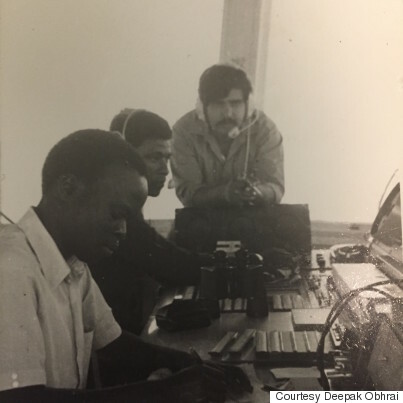 He returned home to work in air traffic control, and was on duty the night the Israeli Defence Forces landed at Uganda’s Entebbe airport to free the hostages held by Palestinian hijackers in 1976. Deepak Obhrai is pictured with Neena, his wife. While Obhrai worked to get an accounting degree and later a job with the city, he threw himself into community work. He and Neena also built a dry cleaning business that expanded to three stores. They had two more children: a daughter, Kaajal, in 1978, and son, Aman, in 1984. Deepak Obhrai with two of his kids in an undated photo. In the 1990s, Obhrai became the president of the India-Canada Association of Calgary, vice-president of the National Indo-Canadian Council for the Alberta region, president of the Monterey Park Community Association, and president of the Hindu Society of Calgary. He lost his first bid for public office in 1993, as alderman on city council. He tried unsuccessfully to win a provincial byelection nomination for the Progressive Conservatives in Calgary–McCall in 1995. A year later, he lost another bid for a PC nomination in Calgary–Montrose. Obhrai says his first attempt taught him how to run an election campaign; the second how to understand party politics, and the third — which he contends was unfairly manipulated — helped him build the base he would use for a successful federal campaign in 1997 under the Reform party banner. At first, Obhrai says, the board of the riding association tried to block him from running but Reform party leader Preston Manning intervened, telling him to “go” for it and to come change the party. Manning declined to comment. But Rick Anderson, who was campaign director at the time and charged with keeping contests fair and open, confirmed that the party leadership did intervene. “I don’t remember the nature of the problem in Deepak’s riding, but I do recall it was one of a handful where the competition was especially intense, and there was some jostling and the rules needed reinforcing,” he told HuffPost. 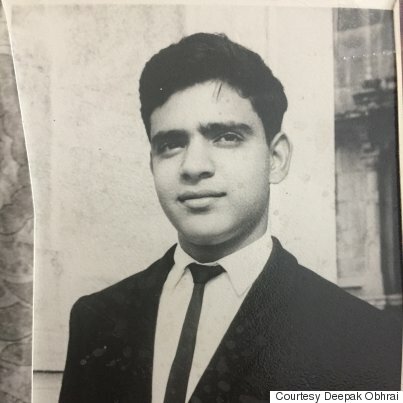 Deepak Obhrai in his first year as a member of Parliament. Obhrai says he didn’t realize the amount of “institutionalized racism that already existed” in the party. Twenty years and seven election wins later, Obhrai is still upset. Last summer, Martin also pegged Obhrai’s odds of winning the Tory leadership at 500 to1. Martin believes Obhrai has a “chip on his shoulder. “I have nothing against him except he's the comic relief and not a serious candidate,” he wrote in an email. Obhrai believes the “traditional” media are not giving him a fair shake. But many party insiders echo Martin’s comments. Obhrai is funny and entertaining but not a serious policy thinker or leadership material, they say. Obhrai says his strength lies with the grassroots. Not just Indians but whites, Lebanese, Filipinos. His money comes from young people and “outside traditional people,” he says, “which is why I don’t register in the polls. Because they go to the traditional supporters. “You don’t need to write that. I’m not interested in that. I’m fine,” he adds. According to the latest Elections Canada filings, Obhrai has raised $108,333 so far, placing him 11th among Tory leadership candidates for both the total amount of donations and for the number of contributors. In 1997, after Obhrai won a seat in Calgary East, he was named caucus liaison for what the party called its “bridge-building campaign.” Obhrai went to ethnic events, held a large Diwali event on Parliament Hill every year, and cemented his role as the “brown guy” in the party. “The party asked me to open up the base, to go around bring in new Canadians, young Canadians into the party,” he says. A decade later, with the now-merged Conservative party in power, prime minister Stephen Harper promoted Jason Kenney, his parliamentary secretary, to the newly created job of minister of state for multiculturalism. Kenney, who is now running to lead the Progressive Conservatives in Alberta, says he doesn’t remember it exactly that way. "Thought he was going to have a heart attack he was laughing so hard." “[Obhrai] was expecting/hoping to be multiculturalism minister, and I was expecting to be a senior minister,” Kenney wrote to HuffPost. “We had a curry lunch where I told him I was going to be PS for multi, and he laughed so hard he was crying. Thought he was going to have a heart attack he was laughing so hard. Kenney did throw himself into the job of ethnic outreach with gusto. He was lauded for his efforts, leading some Tories to believe Obhrai feels eclipsed by his successor. Obhrai had a good gig. He served in the entire Harper government as parliamentary secretary for foreign affairs. If there was a meeting in a faraway land the minister didn’t want to attend, Obhrai would be there. His office is a collection of mementos from his travels: plates, plaques, ornaments. After a few more bites of his lunch, Obhrai pauses. Deepak Obhrai meets the Dalai Lama. Two days previously, another reporter had told him that there are no elders in the Western world. “Once you become a senior, they are told: Keep going buddy, thank you. They do not have that kind of respect…. Now, I understand why their attack was misplaced,” he says. He wants everyone to know he was unaware of this so it can be reflected in “Wikileaks.” He probably means Wikipedia. At 66, the grandfather of two insists he’s running to win and should be taken seriously. He is the dean of the Conservative caucus after all — the longest serving Tory on the Hill. Despite stating in debates that he has “no platform,” he has put forward policy. He wants to spend more on the Canadian Border Services Agency to protect “the largest porous border” in the world. He wants the Business Development Bank of Canada to give start-up loans to students, the unemployed and anyone else with a sound business plan. He wants to cut the $1 billion the federal government spends yearly on settlement costs for landed immigrants. “When I came to this country, nobody gave me money. We came prepared to work hard,” Obhrai says, adding that he would maintain settlement costs for refugees. 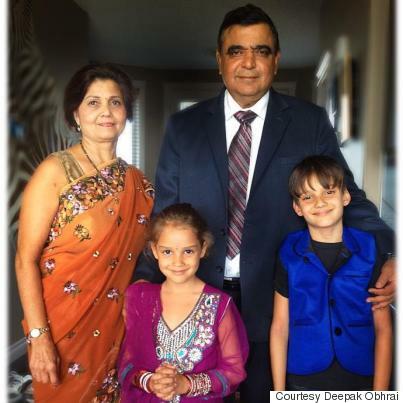 Deepak Obhrai with his wife, and their grandkids Davin, 10, and Evasha, 8. Obhrai favours low taxes and no deficits, but he’s willing to run them when the economy nosedives. He likes the public health care system and wants to invest more in training nurses and would consider creating a pharmacare program. He wants more foreign investment, less regulation and more government investment in green scientific innovation. Specifically, he wants Ottawa to invest in fast-neutron reactors (FNRs) that would recycle nuclear waste from nuclear plants and create carbon-free energy. He’s fine with scrapping the North American Free Trade Agreement (NAFTA) and would prefer that Canada sign bilateral trade agreements with the United States and Mexico, because, he says, such deals create a more equal level playing field. Still, he supports the free trade deal with the European Union because the region is already integrated. One of Obhrai’s biggest challenges as a potential Tory leader may be his language deficit. Despite fluency in Swahili, Hindi, Punjabi, Gujrati, and English, he does not speak French. “Look, I speak five languages, it’s not difficult for me to learn another language,” he says. But he has been trying to learn French since July 2015 and still has trouble stringing a sentence together. His incomprehensible French has garnered celebrity attention in Quebec, something he clearly relishes. English media have also been laughing with him. There’s a viral appearance on “This Hour Has 22 Minutes” and his tips on learning French in a CBC Radio segment (“Forget about grammar”). “From the time I started running, I was told: he won’t make it, he’ll be out, he’ll be this, he’ll be that, he won’t be able to make the money, he should be out, he doesn’t speak French, he doesn’t do anything, nobody knows him,” Obhrai says. “My debates prove that I know what the hell that I am talking about. My French, despite the fact [he doesn’t speak it] went very well. Despite the fact [people said] I wasn’t going to raise the money, I raised the money. I do not follow their traditional way of [thinking]. CORRECTION: An earlier version misspelled Idi Amin's first name. This article has been updated.